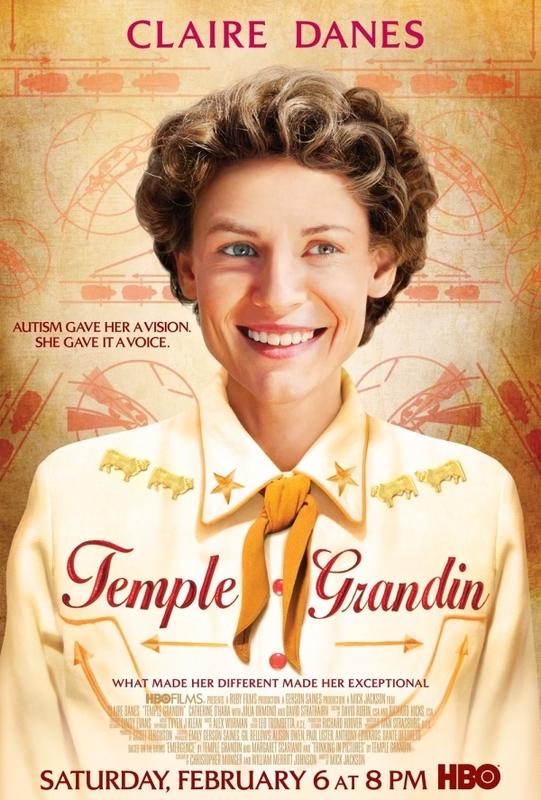 “Temple Grandin” is a really interesting movie about a fascinating woman that allows us an inside look at an unknown world. This is a must-see for people struggling to understand loved ones with autism or for AS people themselves, because close family members will understand autism better and people on the spectrum might see themselves in the intrepid but troubled Temple. “Temple Grandin” is the real-life story of the eponymous character, who struggles with severe autism from an early age, then goes on to become a pioneer in the cattle industry. Temple suffers from an autistic condition which deprive her of a ordinary childhood, but give her an astonishing and intuitive mind and a unique way of looking at things. As a young woman, Temple (Claire Danes) stays at her aunt’s farm, where she becomes familiar with the cattle who live there. When she witnesses a cow being calmed by a squeezing machine, Temple is inspired — when she leaves the farm and goes to college, she builds her own ‘hugging machine’ to dilute the tension that most people relieve by giving and receiving hugs. However, Temple’s new classmates and teachers don’t understand the relief Temple gets from her machine (instead thinking it’s something perversely sexual,) and she must fight for her right to express herself, a fight that continues throughout her life. The film, which premiered on HBO, is based on Temple Grandin’s non-fiction books ‘Emergence’ and ‘Thinking in Pictures.’ As you may have heard before, Claire Danes nails it as Temple. I watched Mrs. Grandin in interview on the special features of the DVD the first time I watched this, and… wow. Mrs. Danes really emulates Temple’s speech and mannerisms. I just hope the actress nails my speech in the upcoming biopic of my life (ha, ha.) The rest of the cast is good too. 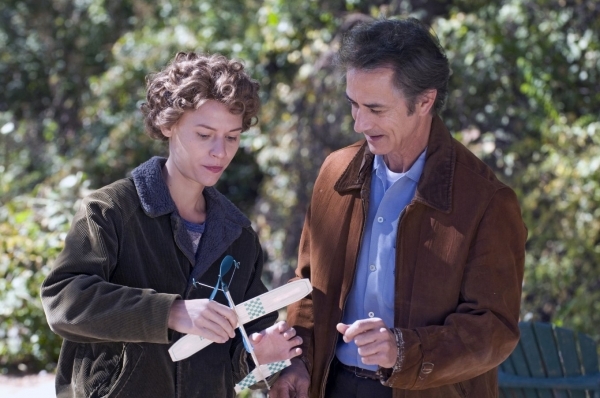 The film features some well known actors such as Julia Ormond as Temple’s courageous mother, Catherine O’Hara as her aunt, and David Strathairn as her teacher, who passes on important lessons to her. I like the way the film visualizes the intricate workings of Temple’s mind so that I can understand them better. “Temple Grandin” is frank in the way that it deals with the bullies Temple must deal with on the road to success. Just think about it this way… are these people heard of except as bullies in an HBO TV film? They’re not even a name. The way I see it, Temple got the last laugh in the end. This film is definitely worth watching, and will keep you intrigued throughout its running time. It definitely makes you think in terms of the people who you slight because you assume they are mentally retarded and have nothing to offer you, but are they? Everyone assumed Temple was either crazy or stupid. Even her childhood doctor blatantly stated that she should be institutionalized and kept from tormenting the masses. And she turned out to be one of the great minds of her time. Anyway, you just never know. Have a great day, and don’t forget to comment *wink*!